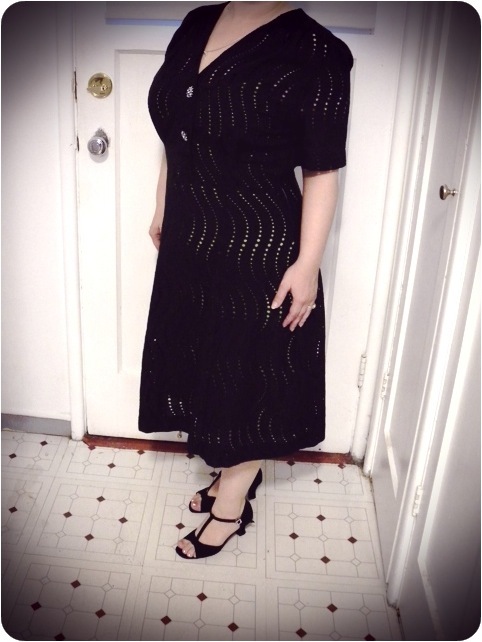 Last weekend I finished sewing that black eyelet dress I mentioned in the previous post. I made it out of Simplicity 2886, the pattern I used for the brown dress I posted earlier this month. 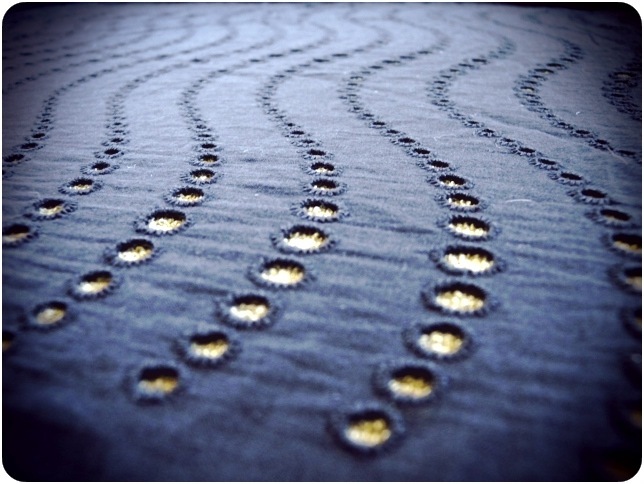 I had deliberated for months as to which pattern would best highlight the swirly pattern in the eyelet. Should I have it go vertical or horizontal? Is it better in a 60’s pattern or a 50’s one? Since it wasn’t going to be a bridesmaid dress anymore, should it be more casual or keep it fancy? Finally, I just threw caution to the wind and went with vertical and the 50’s pattern, which actually looks more late 40’s after I sew it the whole thing together. Pardon the wrinkles on the un-ironed fabric. Cutting the pattern in vertical posed a challenge as it require me to cut the pieces out long-ways on my yardage instead of across. I was also trying to match up the patterns on pieces which always means more wasteful fabric usage. But I think it paid off, as the vertical swirls were totally the way to go and having intentional swirl patterns looks much better than if it had been random. Taking a nod from a vintage black eyelet dress I own, I added black rhinestone buttons to the bodice to really signify “fancy dress” as opposed to sundress. But wait! Those aren’t rhinestones after all. 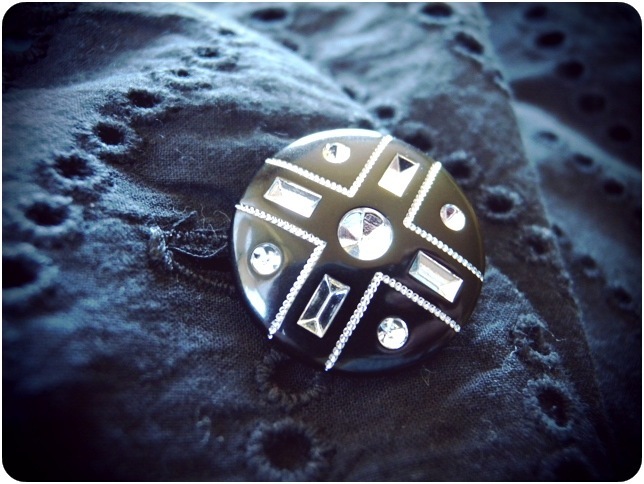 It’s actually an inverted, jewel-cut indentation painted silver to look like a rhinestone. I didn’t even notice this until I took the picture. Total fakers. I guess the upside is that I will never have to worry about the rhinestones falling out or getting caught on something. It’s actually quite functional in that regard. Pretty funny. I also adjusted the neckline on this one as the high scalloped collar of the original pattern, while lovely on the brown dress, looked downright Amish as a black dress. I was going for formal, not funereal or puritanical. The straight v-neck is much better on this now. Never one to miss a chance add pockets, I added one small hidden side pocket on this one. My usual large front patch pockets would have marred the lovely eyelet patterns, so I went with the bare minimum here. Just enough room for a chapstick or phone. So, much to my delight, the black eyelet bridesmaid dress is back on! I’m really excited about this as I loved her black eyelet idea from the get-go and part of me really wanted to stay true to her original vision. Between you and me — and uh… the rest of the entire internet — I had felt sort of bullied into ditching the black eyelet originally. 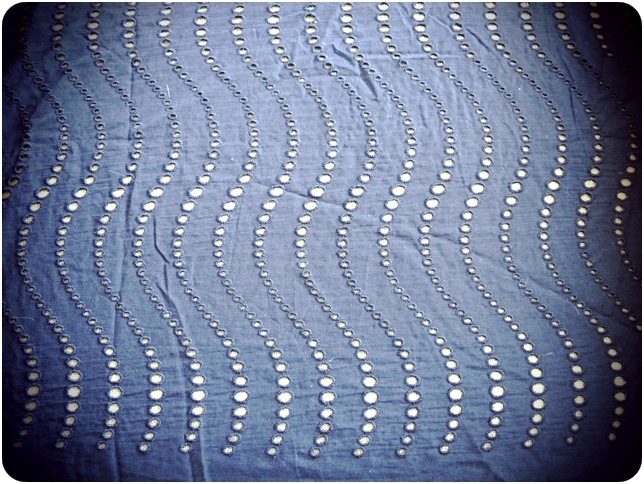 I suspect a lot of people think of eyelet as a really casual fabric nowadays. Maybe even a little corn-pone and costumey. Too many instances of using it in bad community theater wardrobes, maybe? 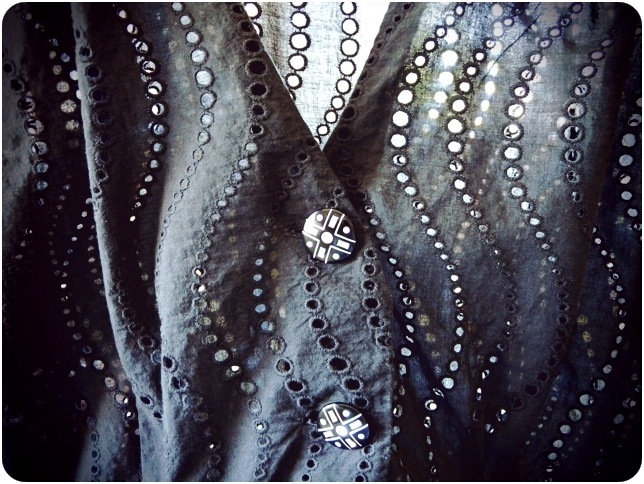 I don’t know why black eyelet is so misunderstood, but maybe that is one of the things that endears it to me so much. 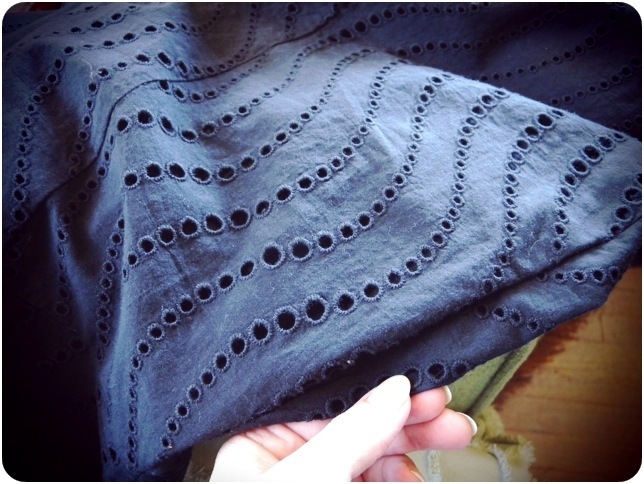 While black eyelet has a solid history of being used in more formal attire, unless you collect vintage or are a big fan of old movies, you might not think of it that way. Thankfully, both the bride and one of the other bridesmaids saw it and totally got what I was going for. With the endorsement from both of them, it’s back on as my bridesmaid dress. Woo hoo! I tried it on with the shoes I am planning to wear (though I’m not totally sold on these as they are wobbly and not exactly what I had in mind) and a bright green slip. For the wedding I’m either going to wear it with a lavender slip (to coordinate with the groomsmen) or a black one. I’ll also accessorize with a necklace and earrings to fancy it all up. So, Bridesmaid dress: CHECK! 4 Responses to "Maybe a bridesmaid dress after all"
Call me old-fashioned, but I always think of eyelet as somewhat fancy. I love the dress. You’re so talented! Yay! Thank you. I am glad you like it We can be old fashioned together. So there you have it: a grand-uncle’s blessing, and confirmation of your status as Queen of Vintagosity. No way! I love this! Total vindication. I will have to tell the bride about this. I’m quite honored to have Uncle Dana’s endorsement on this.